Game Changer: Dr. Francis Dubé, Director, Zenyatta Ventures Ltd.
Dr. Francis Dubé started out in the industry as an activist shareholder who saw a significant asset in the Albany Graphite deposit but yet at the same time shareholders have seen five years of negative return on investment. That prompted a group of like-minded investors, Dr. Dubé explained, that decided to act to turn there company around. They then launched a proxy battle to take over the board of directors and bring in business-minded people to lead the company. “Our message to shareholders was heard and supported and on May 11th 2018, I along with Brian Bosse and Eric Wallman became directors of the company along with incumbents Brett Richards and Brian Davey,” Dr. Dubé said. 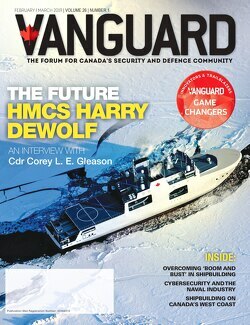 Here is the interview with Dr. Francis Dubé, Vanguard’s Game Changer appearing in the June/July issue. My role now with the company is to build the business case and demonstrate it to all our stakeholders. As a director and Head of Business Development and Technology, I along with my team have to demonstrate the business proposition that exists with this unique product. We have some exciting potential, especially in the graphene markets but this is a new industry and that presents challenges. My role will be to take this potential and turn it into something tangible that shareholders and new investors will be able to recognize and create real value for the company. The most challenging moment during the proxy war was the fact that there really was no significant institutional ownership of the company. We had to reach out to hundreds of retail shareholders by phone mainly and ask for their support. In most cases, trying to rally retail shareholders is like herding cats, but Zenyatta is blessed with terrific shareholders who understand what we have and where we are looking to change. Our message to them was strongly supported and lead to our victory. Now, our new challenge is to execute on the plan we proposed in our campaign and we are excited by our early work and believe we will prove ourselves worthy of their trust. What was your A-HA moment or epiphany that you think will resonate most with our reader, tell us that story? The most exciting news we received in the last year was the results from Tokyo Institute of Technology where they were able to explain why our graphite “…converted much easier and with higher yields of graphene than our reference material.” We have received similar comments from Ben Gurion University in Israel, Sussex University in England and from Canada’s own Dr. Chen at Guelph University but it was not until the report from Tokyo Tech that we understand why our graphite was so different. Without getting too technical, the spacing between graphene layers within our graphite is relatively larger and the graphene layers have some irregular stacking. These attributes are the main reasons our graphite is so well suited for graphene production. I am most fired up in the opportunity in front of us for our investors. Our PEA suggested a pre-tax net present value (NPV) of over $600M at a 10 per cent discount rate while our current market cap is around $35M. This NPV was based on selling graphite at $7.50 per kg while the early graphene market seems to have significantly higher pricing. We have lots of work ahead of us to take this story from a deposit in the ground to a viable business but that potential for our shareholders is why we took on the proxy battle and why we have remained shareholders of this company. The best advice I was given was that I did not need to know everything. As a type A personality, I like to know everything but that is impossible and realizing that early on helped me focus on what I do know and what I can control. This has helped me be a better leader where I entrust people and not micromanage them. We can become more successful as a team because of this approach. One of the habits that helped me be successful is being a good communicator. During the proxy battle, this was instrumental to relay to other shareholders the vision for the company. Now, it is continuing to communicate with shareholders but also with board members and key personnel of the company, First Nations, other stakeholders of the company, potential partners/customers and government officials. For me, in business, it is all about relationships and building trust and that is much easier to do if you can communicate effectively. For me, Steve Jobs was the embodiment of innovation mindset. He exemplifies what one person can mean to an organization. For me, he was the ultimate Game Changer. The graphene industry is challenged by high costs and poor quality product. Zenyatta Ventures has within its power the ability to solve both those challenges. The other challenge for Zenyatta is that the market for graphene is relatively small at the moment. We must use our strengths to support the growth of this nascent industry. We have the ability and I would also say a responsibility to help this industry grow. The bigger the graphene pie gets, the better Zenyatta, as a key participant will do. The biggest challenge in the industry right now is turning promising university research and turning it into industrial, economical success stories. Zenyatta is working with multiple universities at the moment with some great potential applications. If we can turn one or two of these research projects into commercial success, we as a company will be successful. Zenyatta is driving innovation by working with some of the best minds around the world in various universities to develop applications that can help the world be a better place. Some of those applications include graphene membranes for water purifications, graphene-based medical sensors, graphene-infused rubber compounds that could identify when food has passed its best due date, graphene-infused concrete that would reduce greenhouse gas emissions and other promising applications. We are optimizing this research by having a dedicated coordinator for this research working hand in hand with a Head of Sales looking at every potential business opportunity that is derived from this world-class research. The graphene industry has many verticals driven by entrepreneurs. Zenyatta wants to support these entrepreneurs as they are key drivers for growth of this new industry. Putting Albany graphite or graphene in the hands of these entrepreneurs and letting them do what they do best will result in significant growth of the industry. Zenyatta will be happy to be a proud partner to these individuals and companies that drive innovation. Parting piece of advice…in business as in life, we have good days and bad days, the key is to never get too high and never get too low. Set your goals and drive for them. When those bad days come, and they will, just start fresh the next day and keep driving to that goal! Game Changer: Nigel Greenwood, CEO/Principal Consultant, Greenwood Maritime Solutions Ltd.